Melissa & Doug is one of the best-known toy brands in the United States. Since the establishment of this company, it has become one of the most loved and trusted toy companies amongst both children and parents, particularly as they have such a focus on manufacturing products with health and safety in mind in addition to giving children access to both fun and educational toys. Despite the popularity of Melissa & Doug products, few people know the history of this company, the people behind the brand or the extent of the products available. What surprises many people is that Melissa and Doug are actually real people rather than the names simply being chosen to represent the brand. The couple, Melissa and Doug Bernstein, have been married for over 30 years in addition to working as business partners at their toy company. They are very busy people as not only are they running Melissa & Doug, they also have six children; Brandon, Ilana, Audrey, Esther, Sydelle, and Nate. The Melissa & Doug brand has very humble beginnings in comparison to its current and ongoing success. The company was originally established by Melissa and Doug Bernstein in 1988. They used Doug’s parents’ garage and their own basement as a work base. Both Melissa and Doug gave up their corporate careers to start their toy company. A textured wooden jigsaw puzzle, the Fuzzy Farm Puzzle, was the first toy produced by Melissa & Doug. As they were still a start-up company at that point, they did not have the means to transport their product to retailers. Therefore, they borrowed Doug’s father’s station wagon to deliver their products along the East Coast. Customer satisfaction was a priority for Melissa and Doug right from the start. They wanted to listen to feedback about their products from parents. This led to the couple taking phone calls at any time of the day or night. They even put the phone between them in their bed each night. To ensure that each product is safe, it is rigorously tested in accordance with safety standards. However, throughout the years, the Bernstein’s had a rather unusual way of testing their products to see if they provided children with fun and entertainment. They tested each of their puzzles and toys on their own children before manufacturing them. For the first ten years, wooden puzzles were the only toy produced by Melissa & Doug. In total, they have designed and manufactured over a thousand different wooden jigsaw puzzles for children. The Bernstein’s handmade a prototype for each of these puzzles in their Connecticut office before they were mass-produced in their factories. After a decade, Melissa and Doug decided to expand their range of products and began designing and manufacturing a range of wooden toys based on making play more creative and fun for children. Initially, these were aimed at toddlers and included a line of wooden food so that younger children could imitate their mom and dad cooking or doing the grocery shopping. The line of products was then extended further to include wooden toys for babies. Next came the arts and crafts range. Melissa, a naturally creative woman, was inspired by coloring books. Her aim was to create fun and portable craft activities that children could take with them and enjoy wherever they go. This was followed by a range of role play inspired toys for children. Although the headquarters for Melissa and Doug are in Wilton, Connecticut, there manufacturing sites both in the United States and abroad. The company is continuously expanding and has a reported double-digit growth each year. It is estimated that Melissa & Doug now employ approximately 1,000 employees worldwide. Their products now sell internationally and their range of toys continues to diversify. Rather than simply making toys for the sake of selling toys, Melissa & Doug have a mission that they keep in mind when designing and manufacturing each of their toys. 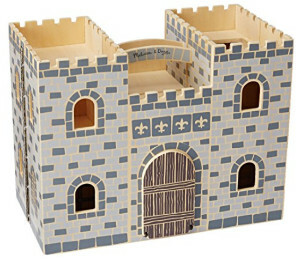 This is evident in everything they create, from the Melissa and Doug dollhouses to the textured wooden jigsaw puzzles. They describe themselves as championing childhood and they use the tagline ‘Take Back Childhood’. Their aim is to provide a launch pad for children that allows them to use their imagination and gives them a sense of wonder. They want to create toys that give children the opportunity to learn about themselves and uncover their passions. Is Product Safety Important To Them? One of the predominant concerns of this company is to create toys that are safe for children. Each toy conforms to both E.U. and U.S. safety standards. They use quite a rigorous process to ensure that this happens. The products are carefully designed with safety in mind throughout the creative process. Once the prototypes are made, the products are tested at home. At the factories, the products aren’t simply tested for safety at the end of the manufacturing process. Instead, they are repeatedly tested at each stage of manufacturing to ensure that each and every product that leaves the factories are completely safe for children. Furthermore, the paints and coatings used on Melissa & Doug products are tested by an independent and accredited testing laboratory. These third-party laboratories are some of the best in the world. 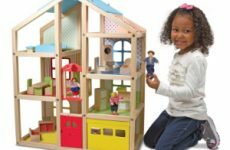 The product range available from Melissa & Doug has expanded extensively over the years since the early days when their main product was textured wooden jigsaws. Their range now includes toys that stimulate all the senses and can be used to encourage specific aspects of a child’s development. 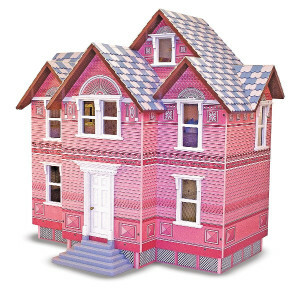 One of their most popular products is the Melissa and Doug dollhouse, which is available in a variety of designs. 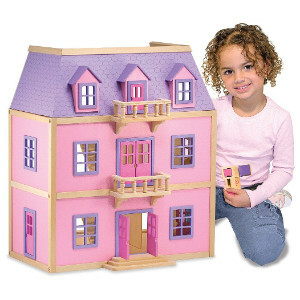 These dollhouses for kids are a fantastic way for children to play ‘let’s pretend’ and role play type activities. 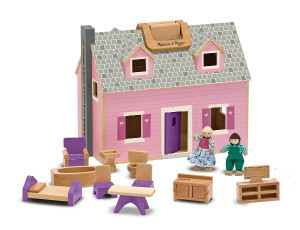 While some of these come fully equipped with furniture and dolls, it is possible to buy Melissa and Doug dolls and Melissa and Doug dollhouse furniture separately. 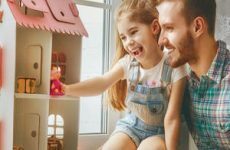 The range of dollhouses available means you can find the perfect dollhouse for a toddler or one suitable for an older child. 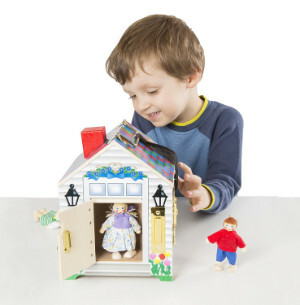 The ‘Let’s Play House’ range of products is fantastic, with a variety of sets available so that children can recreate scenes that they see daily in their own homes. These include fun and colorful sets for cooking, shopping, eating, and cleaning. Melissa & Doug’s arts and crafts products are ideal for children who are creative and enjoy hands-on activities. The products in this category give children the opportunity to try different crafts to learn which they enjoy the most. Some examples of the craft kits available include jewelry making, stained glass window painting, decoupage, embroidery, and quilting. Despite its humble beginnings, Melissa & Doug has grown to become one of the best-known toy brands in the United States. It is a company known for creating good quality toys that are both fun and educational. Melissa & Doug will continue to create safe and high-quality toys for and will expand their product range to reflect the changing trends and interests of children.